The U.S. Navy has initiated a new acquisition process for information technology products and services that involves coordination with industry while the contract is being developed, FCW reported Tuesday. Capt. 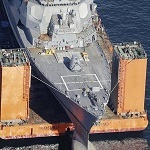 Donald Harder, deputy program executive officer for the Navy’s enterprise information systems, told reporters that the new method has been in place for two months and is intended to reduce the time it takes to negotiate contracts by four to six weeks. The Navy pushed back the award of its Next Generation Enterprise Network Re-compete contracts to test a “sprint” procurement method that gives companies the opportunity to provide feedback on portions of the contract as drafts are created. Harder said the new process also involves weekly conference calls and one-on-one sessions with companies to address questions and concerns on the drafts. Hewlett Packard Enterprise currently holds the $3.5 billion NGEN contract that was originally scheduled to end in June but has been extended to allow for transition. The re-compete acquisition includes a contract for end-user hardware, which could be awarded in November 2018, and an IT services deal that could be issued in December 2018.